Undercarriage: G&Z D-5 size Crawlers, sealed chain with Split Master Link. Heavy Duty Planetary gear reduction boxes. 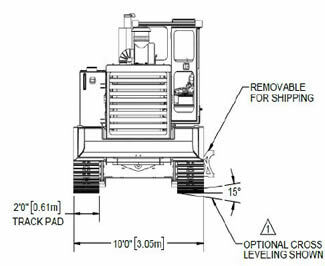 Automatic cross-level control of undercarriage. 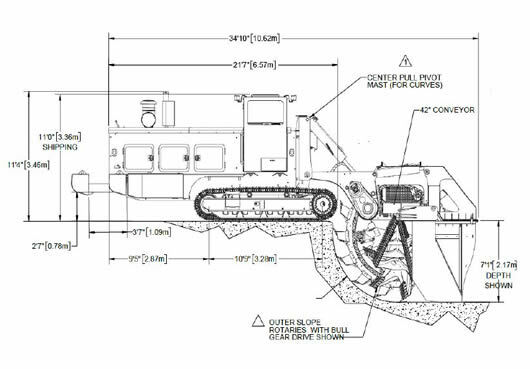 Pivoting structure between Trencher Body and undercarriage frame with manual or automatic hydraulic cylinder control to accommodate minor variations in the berm cross slope grade. Speed: Working speed approx. 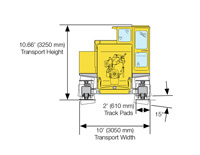 0 - 120 fpm (0 – 36 mpm) and Travel speed approx. 0 - 2.2 mph (0 - 3.5 kph). Additional buckets, rotaries, and crumbshoes for different canal cross sections. Consult with factory.